A holdover release of sorts, Arch Enemy's latest EP groups together three covers, some live tracks, and the band's latest single for all those clamoring for more of Angela Gossow and crew's Swedish metal surprise. 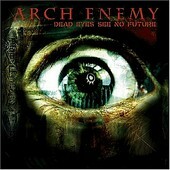 Running through songs by Megadeth, Carcass (Michael Amott's former clan), and Manowar, in addition to pristine, stunning live renditions of "We Will Rise", "Burning Angel", and "Heart of Darkness" that rival the original studio recordings, you simply can't get more metal on an EP than Arch Enemy managed to on Dead Eyes See No Future. Hopefully, this carryover release can satisfy the fans enough until a new studio album is unleashed. If you're curious about the fuss or an ardent fan, this is a must have.